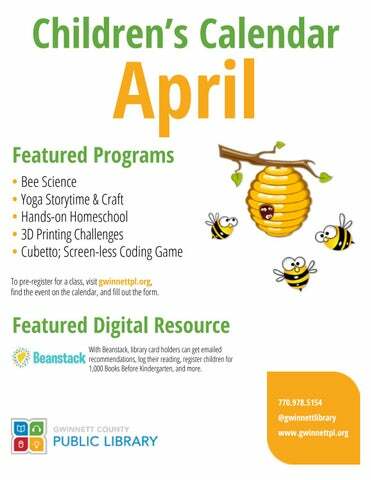 • Bee Science • Yoga Storytime & Craft • Hands-on Homeschool • 3D Printing Challenges • Cubetto; Screen-less Coding Game To pre-register for a class, visit gwinnettpl.org, find the event on the calendar, and fill out the form. 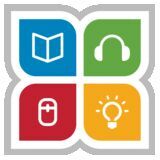 Featured Digital Resource With Beanstack, library card holders can get emailed recommendations, log their reading, register children for 1,000 Books Before Kindergarten, and more. Spring Break Around the World Stories, Science Lab: Bubbling Up! Ages 9-12 for ages 2+ Wednesday, April 3; 1:00 pm Every day storytime; 10:30 am Hands-on experiments about bubbles Monday-Friday; April 1 - April 5 Spring Break Around the World Ages 8-12 Monday - Friday; April 1 - April 5; 2:00 pm Different continent each day Toddler Time, ages 2 & under Tuesdays; 10:30 am: April 9, 16, 23, 30 Preschool Storytime, ages 3+ Wednesdays; 10:30 am: April 10, 17, 24 Baby & Me Program, pre-walker babies Thursdays; 10:30 am: April 11, 18, 25 Baby likes Vivaldi! Legendary Lives Series, ages 8-12 Wednesday, April 17; 5:30 pm Who Was Steve Irwin? Straw Bale Gardening, all ages Saturday, April 13; 2:00 pm Planting ingredients for pizza! Special events are listed in orange. Visit gwinnettpl.org/calendar to sign up for programs that require registration. Little Engineers, ages 5-10 Friday, April 5; 3:30 pm Activity: Fort building! Family Game Afternoon, all ages Saturday, April 20; 2:00 pm Fun games enhance math skills! Library Lab, ages 5-12 Tuesday, April 30; 4:30 pm Make penny spinners! Mango Languages is an easy way for homeschool children to learn another language. visit gwinnettpl.org to get started!